After being diagnosed with breast cancer at age 47, Naomi Green knew she had to make a lifestyle change. "I thought I had been living a healthy lifestyle," Green, now 52, says. "I jogged with my dogs. I shopped at Whole Foods. I knew about kale and açai!" Green, who lives in Spring Hill, about an hour north of Tampa, made it through a mastectomy, chemotherapy and radiation, but when her doctor told her she'd need to take an estrogen inhibitor for at least the next 10 years, and that even after that her cancer might come back, she balked. "I was so distraught, I went home and cried," she recalls. "Then I started Googling 'food and cancer' and 'nutrition and cancer,' and that's how I found the documentary Forks Over Knives.'" Forks Over Knives follows a group of people who have chronic medical conditions like heart disease and diabetes as they make the transition to a whole-food, plant-based diet. By the end of the film, many have reduced their dependence on medication; the two doctors who star in the film posit that those results are due to the changes in their food consumption. 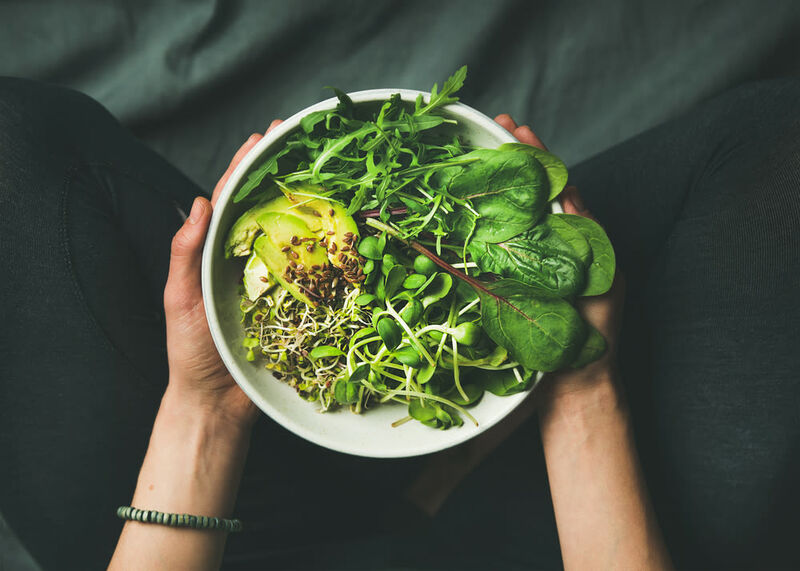 Green was deeply affected by the film, and by the book Radical Remission, by Dr. Kelly Turner, which suggests that a plant-based diet was a major factor in the remission of cancer patients who had previously been told they were terminally ill. "I could do this," Green thought. 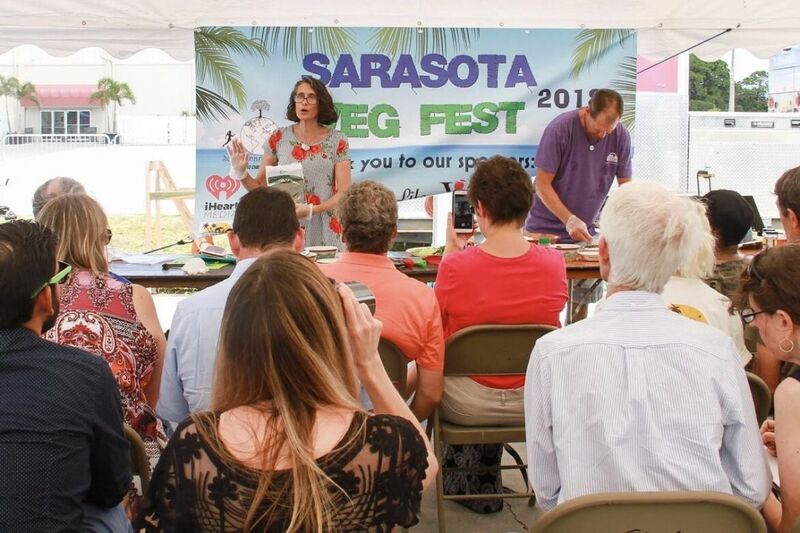 Naomi Green (standing) presenting at a previous Sarasota Veg Fest. Overnight, Green went vegan. She got rid of every meat, dairy and egg product in her fridge. And over time, because she felt so good on her new plant-based diet, she decided to take it a step further and become a vegan lifestyle coach. She became certified through the Main Street Vegan Academy in New York City and launched a website for people looking for help going vegan for health reasons, as well as a Facebook group. She also tells her story and celebrates veganism at events like the upcoming Sarasota Veg Fest on Saturday, May 4, where she'll moderate two panels—one on diet and nutrition titled “Food As Medicine Physicians Panel," and another called "Real Patient Health Turnaround Success Stories," featuring people who say their health has been transformed thanks to a plant-based diet. Green suggests watching one of the many documentaries about plant-based diets. "While you're watching, ask yourself, 'How could this affect me and my life? '," she suggests. "When I watched Forks Over Knives, my mind was blown." Approximately 65 percent of us have a reduced ability to digest lactose after infancy, anyway, according to the U.S. National Library of Medicine. Green says the easiest way to begin is to figure out which plant-based milk you like. If you have kids, she suggests making it fun. Do a blind family taste-test to pick your favorite. Look for naturally vegan whole foods. "A lot of people will say, 'I don't like vegetables,' and to them I say, 'I bet you like potatoes and corn!'" Green says. "I like to tell people to keep it really simple. Pick three vegetables you love and make a menu from them. And if you don't love kale, don't make kale salad! The next week, you'll be ready to try three more ingredients, and same with the week after that. Your palate will just grow." Sarasota Veg Fest takes place at the Sarasota Fairgrounds, 3000 Ringling Blvd., Sarasota, from 10 a.m. to 5 p.m. on Saturday, May 4. To see the program, click here. For more information, visit sarasotavegfest.com.